A major irrigation project in Turkey has seen the country's arid heart irrigated for the first time. The Blue Tunnel Project on Thursday started transferring water to the Konya Plain in Anatolia, an official of State Water Works Department confirmed. The second-largest irrigation scheme of Turkey after the Southeastern Anatolia Project (GOP), the Blue Tunnel aims to provide the Konya Plain with 414 million cubic meters of water annually in order to maintain agriculture and save wildlife. The tunnel, the most important leg of the massive Konya Plain Project (KOP), will enable 235,000 hectares of agricultural land to be irrigated with water which flows from Mediterranean Basin to Konya Closed Basin. 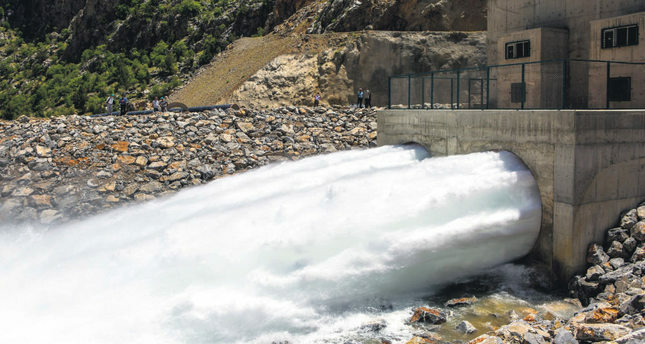 "The water of Göksu River is collected in Bağbaşı Dam, which was constructed in the first phase of the project with 180-million-cubic-meter capacity, and is directed to Konya Plain with a 17-kilometer long Blue Tunnel" said Uzun. According to Uzun, the project was begun by Ottoman Sultan Abdülhamid II 120 years ago: "It was attempted many times through the years but the project could not be made real." "President Recep Tayyip Erdoğan put so much effect into this project as well as Prime Minister Ahmet Davutoğlu, who is also from Konya," he said. Stating that the water would be also directed to Hotamış Storage via a 125-km channel, Uzun said: "The lake, which is going to be formed here, will be Turkey's biggest artificial lake." "With this project, the climate of Konya will be changed, the product range will be increased and 700 million cubic meters of water will feed Konya Plain instead of emptying into Mediterranean Sea." "Konya will not have any drinking water problems until 2050," Uzun added. KOP is considered to be the most comprehensive project to bring water to Konya Plain. Over 1 million hectares of soil will be irrigated, 1.5 million people will have potable water, and three billion kilowatt/hours of energy will be produced annually when Konya Plain Project is fully completed.